The government said: "In November 2006, a VW employee requested that an IAV employee assist in the design of defeat device software for use in the diesel engine." A German engineering firm has agreed to plead guilty to a felony in the United States and pay a $35 million fine for its role in assisting Volkswagen Group to market and sell diesel-powered vehicles in the U.S. that used a defeat device to cheat on emissions testing. IAV GmbH, headquartered in Berlin with offices in suburban Detroit, allegedly helped VW engineers develop the software needed to temporarily alter the performance of VW's Gen 1 diesel vehicles, beginning in the 2009 model year, allowing the automaker to recognize and pass emissions testing, the U.S. Department of Justice announced Tuesday. IAV is co-owned by Volkswagen Group. The company has agreed to plead guilty to one count of conspiracy to defraud the U.S. and the automaker's customers in the U.S. to violate the Clean Air Act. The department said IAV has agreed to enter its guilty plea in U.S. District Court in Detroit at 9:30 a.m. on Jan. 18. The $35 million fine was set under U.S. sentencing guidelines "according to the company's inability to pay a higher fine amount without jeopardizing its continued viability." Volkswagen pleaded guilty to three felonies in March 2017 over its diesel emissions scandal, and agreed to pay a criminal fine of $2.8 billion, as well as agreeing to be under an independent corporate compliance monitor for three years. In addition, eight people have been indicted in the matter by U.S. authorities, including former VW CEO Martin Winterkorn. Two former VW officials have pleaded guilty and been sentenced. The six other charged defendants, including Winterkorn, are believed to reside in Germany under the protection from extradition afforded them by the German Constitution. In a written statement, U.S. Attorney Matthew Schneider said: "IAV participated in Volkswagen's deception of American regulators and fraud on American consumers. As this guilty plea demonstrates, our office will continue to aggressively prosecute corporate criminals, even when they work at some of the world's largest, most prominent companies." According to plea documents filed with the court in the case against the German engineering firm, VW engineers "delegated certain tasks associated with designing its [Gen 1] diesel engine to IAV, including parts of software development, diesel development and exhaust after-treatment. "In November 2006, a VW employee requested that an IAV employee assist in the design of defeat device software for use in the diesel engine. 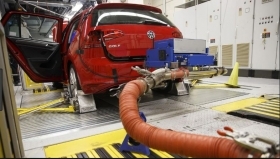 The IAV employee agreed to do so and prepared documentation for a software design change to recognize whether a vehicle was undergoing standard U.S. emissions testing on a dynamometer or it was being driven on the road under normal driving conditions." If the software found the vehicle was not being tested, its emissions control systems were greatly reduced, allowing the vehicle to emit NOx levels up to 35 times higher than the limit allowed under U.S. standards. The Justice Department said that by 2008, "an IAV manager knew the purpose of the defeat device software, instructed IAV employees to continue working on the project and directed IAV employees to route VW's requests regarding the defeat device software through him; the manager was involved in coordinating IAV's continued work on it." Approximately 335,000 Gen 1 Volkswagen and Audi vehicles sold in the United States were involved, the department said. IAV’s statement says that the firm “played a minor role in the offense” and that it’s already taken steps to enhance compliance and internal controls.